It is disconcerting for an Englishman wrapped in a thick overcoat to see Indians leisurely walking along on the coldest day with nothing but the thinnest of pyjama-like garments to protect them. Their walk is usually a flat-footed shuffle which may be necessary to keep their heel-less shoes on. It seems aimless and their preoccupied manner suggests a disregard of time very foreign to the streets of London. Although appearing so out of place in the East End, they are well able to look after themselves, being regular seamen who came to the Docks time after time and have learnt a little English and know how to buy what they want. Nowadays the lascar in London has a friendly institution to watch his interests, but at one time these men were freely victimised by keepers of lodging-houses, and opium dens; and other sharks robbed them of their earnings and left them destitute in a not too friendly London. No provision was made for their welfare until 1854, when certain missionaries planned to provide a house for Oriental Seamen. This plan was generously supported by the Maharajah Duleep Singh and other Indian princes, and in 1856 the Prince Consort laid the first stone of the "Strangers' Home for Asiatics, Africans, and South Sea Islanders." This Home in the West Indian Dock Road, now known as the "Asiatic and Overseas Home." was opened in 1857. 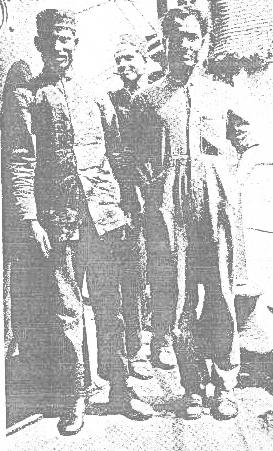 Besides providing a lodging for seamen waiting for ships, the staff of the Home did very necessary work in protecting the lascar from the unscrupulous men and women who preyed on him and in providing friendly interpreters in Police Court cases, often preventing convictions which would have resulted in the Oriental losing his ship. The majority of lascars come of seafaring families living on the coasts of Bengal, Burma, and Ceylon, or the Gulf of the Cutch, in the Maldive and Laccadive Islands. The Punjab also is the home of thousands, most of whom are firemen. A "lascar" has been officially defined as "an Asiatic seaman, native of the British Empire," but the term is also applied to the many seafaring inhabitants of East Africa. Most of these are the Christian inhabitants of Goa, in Portuguese East Africa, who excel as ship's cooks. the word derives from the Persian "lashkar," meaning an army or a camp. In time it came to mean a soldier, and in the seventeenth century it was first applied to sailors. There has been much agitation against the employment of foreign seamen in British ships. last December a deputation of the National Seamen's and Firemen's Union called attention to the fact that the employment of coloured sailors was keeping British seamen out of work. and the question is being examined by a committee representing the shipowners and the Union. When a previous enquiry was held in 1902, many of the numerous witnesses called gave evidence of the good qualities of the Indian seamen, and a representative of one great steamship line stated that their steamship services could not be maintained without them. Their sobriety, patience, and unquestioning obedience are valuable qualities in a career where there is much monotonous routine work. the apparently serene contentment of a gang of lascars chipping all day with the hammer is an instance of indifference to monotony. Their ability to stand the 160 degrees of a stokehold on a Red Sea trip justifies their employment as fireman. The advent of steam and motor power has simplified the work of the seamen, who nowadays need a less highly skilled training in seamanship, so that the comparatively inferior labour of the Indian meets the needs of the shipmaster more than in the days of sail. Though the shipowner may allow 50 per cent to 100 per cent more men in a lascars crew than in a European one, the wages bill may still be lower, so economy may also be urged in their favour. Whatever may be the merits of their case, however the number of lascars employed on British trading-vessels increases every year. The ;last available census returns, those of 31st March, 1928, show a total of 52,445 lascars employed on that day, which is over 26 per cent of the total seamen at work. About half of these were working on passenger vessels; taking the figures of engine-room crews the proportion is over 30 per cent. Lascars are recruited in gangs by the serang, or native boatswain, who is also responsible for their discipline and their work. All orders are passed from the officers through the serang to the native crew. The start as "boy" and become "topman", which corresponds to the British A.B. the gang includes a cook and usually a "topass", i.e. a no-caste sweeper who does the dirtiest work which the caste man may not touch. It is said that some serangs extract dustoorie out of their men, making sure of the bribe before they will employ them, but the authorities safeguard the lascar as far as possible by paying each man his wage individually. Those who cannot sign the pay-roll, and they are in the majority, give their receipt my the impress of their thumb, previously pressed on a stamp pad; the pay-sheets then bear a certificate that the captain has paid the amounts and the chief officer has witnessed the payment. Oriental seamen are protected by the Indian Merchant Shipping Acts, which regulate the terms of the contracts shipowners must enter into with all lascars they engage. These agreements must be made before a shipping master, and must contain stipulations providing for the return to India. The master of the ship is required to give a bond of one hundred rupees for each man engaged. Agreements may be made binding a lascar to make a voyage to the United Kingdom and there enter into another contract to return by another ship. If the Indian refuse the second contract, the case is referred to one of the Lascar Transfer Officers, who in the case of London, have their offices in Poplar, Victoria Dock and Tilbury. If he considers the ship suitable and the contract in order, the lascar is bound to sign on. The agreement must contain a scale of rations, which the shipowner agrees to supply, and this scale must not be less than that laid down by the law. the main item in the diet is rice, with dry fish, or fresh meat, flour, dal, (a small grain), ghee (goat fat), vegetables, curry, tamarind, tea, sugar, and lime-juice. Quantities are slightly increased in the scale laid down for cold weather. As regards accommodation, the lascar is entitled to the same allowance of space as the European seaman. He is secured against destitution when incapacitated by an accident, by the Workman's Compensation Act, 1923. Undue suffering from exposure to northern weather is prevented by law, which limits the areas of voyages on which Orientals may be carried. Voyages around Cape Horn, through the Straits of Magellan, winter voyages to the Baltic, and some North American ports may only be undertaken with lascars provided they voluntarily sign special agreements and arrangements are made for heating their quarters and for the supply of warm clothing. masters of ships carrying lascars must lodge with their inward clearance papers at the Customs Office a list and description of all lascars taken on at the commencement of the voyage and an explanation of the whereabouts of any not on board. They must also notify any discharge, transfer, death, desertion or other change in the lascar personnel to the British Consul or Customs Officer of the next port and obtain his certificate that the change was either authorised or unavoidable. When for any reason a lascar becomes destitute, he comes under the care of the Lascar Transfer Officer, who arranges his return to India and may claim the cost from the master or owners of the ship which brought him over if they are in any way responsible. All these legal provisions are made for his security. Nowadays the British Merchant Service offers attractions of security with good pay and living conditions to the Indian coast-dweller who usually makes it his life work, and becomes a steady and hard-working seaman. This article was transcribed from the P.L.A. Monthly February 1931.